An immensely powerful unit. Critical hit when at or below 40% health. Giants are the most expensive ground units. They are available to recruit from a Barracks for 1200 gold. Although they cannot capture structures, they are effective against all other ground units and commanders. Golem Cherrystone Kingdom Golems are the work of Cherrystone's master stonemasons. They are constructed from the toughest rock washed ashore from Guardian's Teeth, and shaped with tools made of dragon scales. At the heart of each Golem sits a single, pebble-sized Cherrystone, its power imbuing the lifeless stone with sentience and purpose. Those brave enough to place their ear to the Gole's chest may hear strange whispers from within. Revenant Felheim Legion A Revenant is a living shadow, raised from somewhere beyond death by the combined powers of many Warlocks. Part protection and part prison, the interior of the Revenant's armour is inscribed with ancient wards that form a binding curse, trapping the living shadow inside and dominating its will. Oni Heavensong Empire Though both less advanced and far less agile than Prince Koji's puppet Tenko, Oni MK II battle-puppets use variations of the same technology. They may appear clumsy and hulking in comparison, but they can deliver an immensely powerful punch. 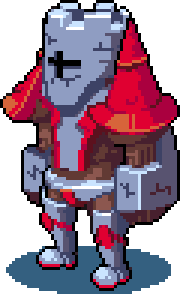 The unarmored Oni MK I was used solely as a construction device, and is a common sight in Heavensong's ever-growing capital. The Oni riders wear the 'mask of the ox' as a mark of their power and resilience. Gloom Giant Floran Tribes It is a creature woven from the roots of the Great Tree that grows at the centre of the Gloomwoods. Armoured with the tree's bark, its kind are considered to be protectors of the Floran Lands. If not called upon to defend their homeland, the Gloom Giants gather around the Great Tree, where they wait silently for years at a time, often allowing the forest's many small creatures to nest upon them. The Giant will always score a critical hit when it is at 40% health or lower. If an incoming attack reduces a Giant from above 40% to at or below that threshold, the Giant's counterattack will be a critical hit. Giant has by far the largest critical hit multiplier of any unit, at ×2.5. Despite this, it is never capable of doing more damage than it has at full health. At precisely 40% health, its critical hit will allow it to deal as much damage as it would deal at 100% health, but no more. Overall this puts the Giant in a relatively unique situation in which it can dish out devastating attacks even at low health. This critical hit rewards more reckless use of this unit compared to other expensive units, such as Dragon or Warship, either of which is much less effective at low health compared to a Giant. Giant is an immensely powerful unit balanced by the fact it is also immensely expensive, costing a whopping 1200 gold. This is the same gold cost as eight Spearmen, or entirely twelve Soldiers. By this nature the Giant is at its most useful in any situation where gold is abundant, but Barracks or other unit-deploying buildings are scarce. A Giant performs exceptionally well against all other ground units if adjacent to them. Even if attacked first, its counterattack is often capable of destroying a full-health ground unit in a single hit. The only significant problem this unit faces on the ground is a well-positioned Trebuchet or, to a lesser extent, another Giant. A Warship is capable of doing as much damage to a Giant as a Trebuchet, provided there is sea near enough for the Warship to get in a shot. Like many ground units, a Giant has trouble with air units, as it cannot attack nor counterattack any of them. The Giant's single greatest threat is easily the Dragon, the only unit actually capable of destroying it in a single attack. Even without a critical hit, a full health Dragon will usually swipe more than half of a Giant's health without taking any counterattack. When deploying a Giant on a map where Aeronauts or Dragons are a potential threat, it is paramount to deploy the Giant with support from anti-air units such as Mages, Sky Riders, or Harpoon Ships. Despite its immense power, the Giant will usually fail in battles of attrition. That is, where deployment buildings are abundant but gold is scarce. It costs as much as eight Spearmen, but if there are eight Barracks to deploy eight Spearmen in a single turn, the latter will not only win a typical battle against a Giant but be much more versatile. Notably, Mage's Heal and Mercia's Healing Aura are at their most efficient when healing either Giants or Dragons considering these units' high cost. Considering its high cost (1200 G), Giant is not gold-efficient units. Instead of expecting Giant to deal a huge damage amount ot its cost, another strategy is to focus on using the giant to be disruptive. Walking a Giant through a hole in the enemy lines forces them to commit a large number of units to take it out, and that chaos can give the rest of your army a lot of opportunities to cause havoc. It's those opportunities that you're really looking for when you build a Giant, moreso than the Giant's own direct damage output. Just be careful about trebuchets, dragons, and warships. They can end your rampage in a hurry if you let them set up a crit. Because of the way a Giant's critical hit functions, its critical hits will never actually do as much damage as is listed in the preceeding table. These hypothetical values are only listed to give context to how much damage a Giant can do with its crit as opposed to without. Notably, a Giant deals more damage to Strongholds than any other unit type. The only unit types which can deal more in a single attack are the Trebuchet and Warship, but only if they score a critical hit. Giant's sight range of 3 is lower than any other unit in the game. Even the humble Villager has a sight range of 4. When moving, a Giant's footsteps emit a uniquely loud and deep sound. This movement sound is shared only with Koji. During its attack animation, a Giant belonging to any faction will first pose in a manner that flexes its biceps upwards. The pose does not appear to serve a practical purpose, but some believe it is a reference to Mazinger, a fictional giant robot who makes the same pose before using a powerful attack. It is a grave crime for a Floran to attack another Floran with a Gloom Giant. This page was last modified on 8 March 2019, at 18:37.